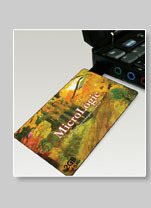 Micrologic has an operating IT business since 1990 and is very successful in exporting to more than 50 countries around the world. The major business division is IT components trading service. Now we are starting in portable storage products such as memory card, USB disk, mini HDD and are currently expanding our business into multimedia products such as MMV, DVB-T USB TV tuner together to complete our customers’ needs. © 2006 MicroLogic International Corp. All rights reserved. For Online Real-Time messaging or quotation requesting, please add desired sales'Skype. or click HERE for detail sales listing.